Billy Jay was born in St. Petersburg, Florida and this native did not stray far from his roots for radio work. Billy's real name is Bill Jacobs, his dad Murray ran the Goodyear rubber store downtown. Bill’s passion was always rock & rock, though he had a penchant for show music like “West Side Story.” Billy worked at WPKM, WLCY and this photo was taken in 1972 shortly after his arrival at WFSO The Big 57. Bill got out of the radio business in the late 70's after encountering some health problems. He is retired and still lives in St. Petersburg. Asked what his mission in life was... “I hope in some way, I can help make the world happier”. You did Billy, you did. 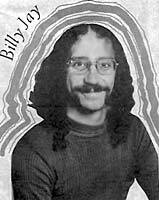 Billy Jay, who made his mark in the 60s and 70s at WLCY and also WFSO passed away April 1st from renal failure. The 69 year old was as kind a man as you could find, truly a gentle soul. He will missed by those who knew him and worked with him.